When released in 2003, Akercocke were little known to me, only by noticing that their dress sense live was rather odd, and that they had sexual content within their lyrics. Whether that already convinced you to pick up this album or not back then, it’s fair to say that this record is preposterously good, and hindsight never should aid such a remark. A definitive ‘majestic’ was told to me by a companion of mine, to somewhat characterize their music and it’s an excellent comment. Such is the majesty of Akercocke on Choronzon; their typified black metal brutality is exalted within its progressive movements. As you move throughout the album, the change of gear is so great, perhaps you’ll feel inebriated or exhilarated throughout the fumes. 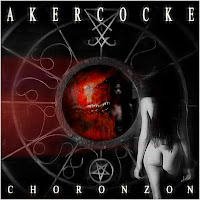 Akercocke dare I say have set the standard for extreme metal on this record moving out of the underground and can be considered much heavier and exceedingly extremer than that of underground blasters. Notably the Satanist vocals are interesting, and even though myself being categorically tagged ‘atheist’ or ‘nontheist’ could perhaps inherit the overall lyrical values differently, I do see the general insight and devoutness within such meaning. Akercocke’s combination of progression, and extreme brutality, is incredibly artistic, and peaking to various technical boundaries. Furthermore their beautiful two-note swinging riffing combined with melodic guitar lines in contrast to sections of absolute nefarious brutality is ones self stylistic following within the genre, and it’s a delight. Their influences coming through on this record perhaps more than ever before, it can flood memories of everything you’ve heard before, to completely nothing. The villainous synth work is something which should be accredited; it adds dimension, and dementia to the overall piece which again feels artistic and helps contrast this overall wave of brutality, and beauty. An intoxicating release, that is breath taking and should undergo a careful listen. Musical magic, enjoy - 5/5.